Cities in the list were picked from the top 35 metro areas. Does not include any other taxes like property tax or sales tax. The not so surprising result is that New York City has the highest combined income tax coming in at $33.1k (33.1% of income). Not far behind are Portland, Baltimore, and Philadelphia in that order. I am shocked by how high the taxes are in those cities, especially since they don’t have the reputation of New York. At the low-end low tax cities in Texas, Florida, Nevada and Washington all tied for last place, since they do not have incremental state or local income taxes. 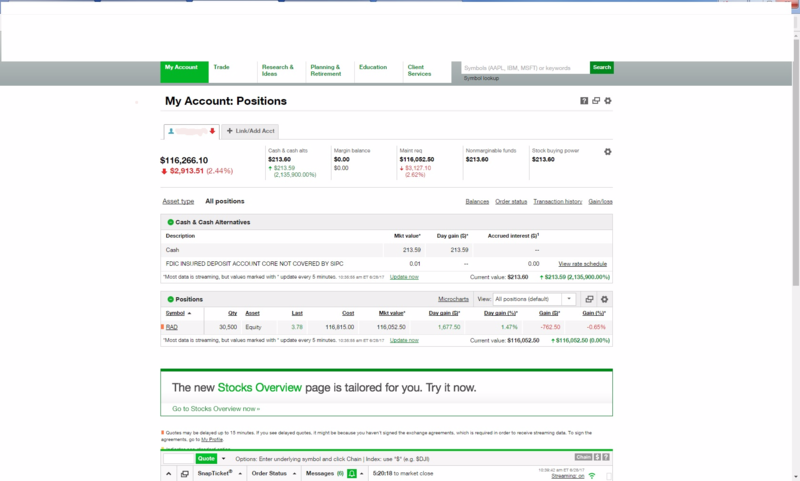 Note: If you are on mobile, you can drag the table right or left to see the Federal, State and Local tax amounts. The triennial updates have begun! Today the Federal Reserve released the latest results from their 2016 Survey of Consumer Finances. This survey contains detailed information on the financial status of American households on things such as retirement, net worth, income and debt. All percentile calculators (Net Worth and Income) using Survey of Consumer Finances data from the US Federal Reserve have been updated today. Minorities and Americans without college degrees showed greatest gains in wealth since 2013, new data says – The newest survey has reported show double digit percentage gains in net worth and income for certain minority groups and less educated households. 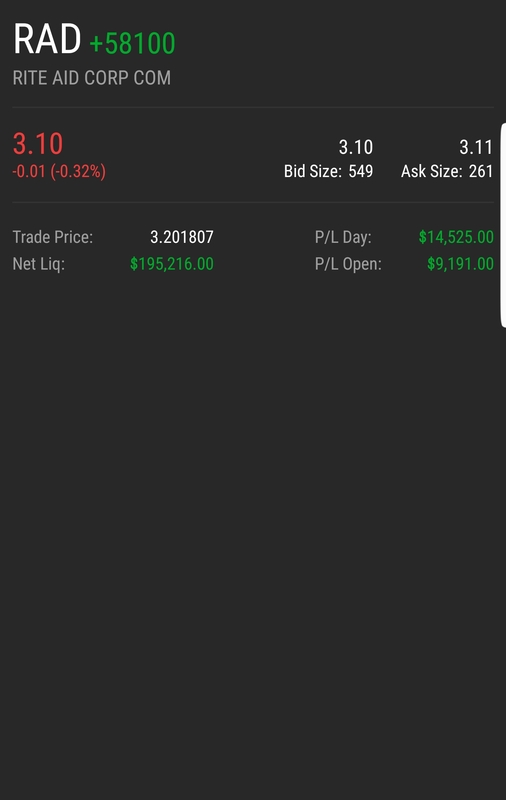 The nominal gains are relatively low. I recently came across a new metric, the Green Swan’s FIRE Prowess Score, to measure my progress in achieving financial independence / early retirement. It’s an interesting twist on a savings rate calculation. Like many savings rate metrics, it is tied to your gross income (pre-tax), but the amount that you save is your change in net worth. The thing I like about this formula is that is builds in a measure that combines your gross income with your net worth growth. The ratio takes into account growth in equities and retirement. For more specifics on the basic thoughts read TGS’s article about it. I really like to benchmark how I’m doing versus a goal, which is why I made this. The assumptions are pretty crude, but I think for a general goal this is good. 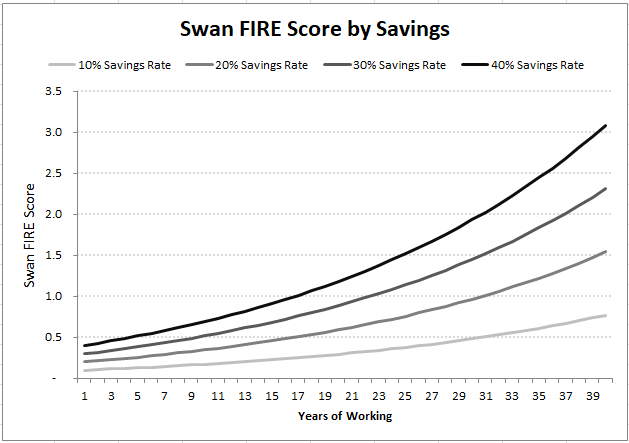 Swan FIRE Score by Savings Rate and years of working. As you can see in the graph over time, the person’s Swan score continues to scale even though their savings rate is steady. I think it really demonstrates compounding growth and the importance of earlier savings versus later savings. 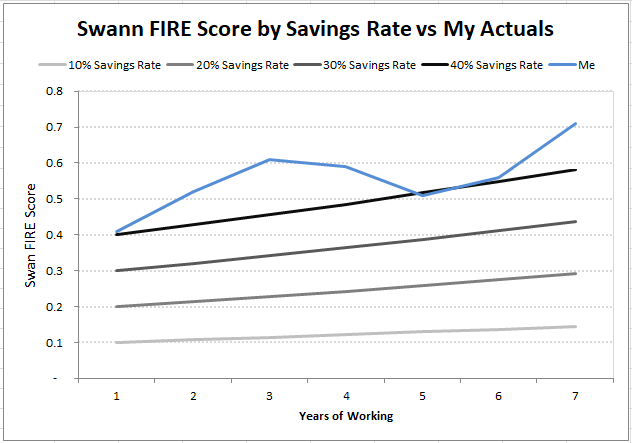 Here’s a link to the spreadsheet I used so that you can play around with some of the assumptions Swan FIRE Score by Savings Rate. I’ve been working 6 years after college so far, and my usual results vary between 0.41 and has grown to 0.71 for my project year ending score. My lifetime rate has been 0.54. I’m using some data pieced together from the Social Security Administration on how much I earned each year, and then my net worth readings are from end of year. According to TGS, my score is good and will bring me on the track to FIRE eventually. I’ve decided that my target comparison rate is with the 40% savings rate scenario. My Swan score vs the theoretical goals. As you can see in the graph, my performance has been at or above that rate for the past 7 years. Full disclosure, my actual savings rate varies between 40% to 50%, but I like to sand bag my goals. In addition, the last 6 years looks great partially because of the booming stock market. But let’s say this was 2008, the metric would be depressingly negative. I think overall this is a good metric, because it definitely gives some standards to reach for. I’ll probably keep a log updated every now and then with this score. 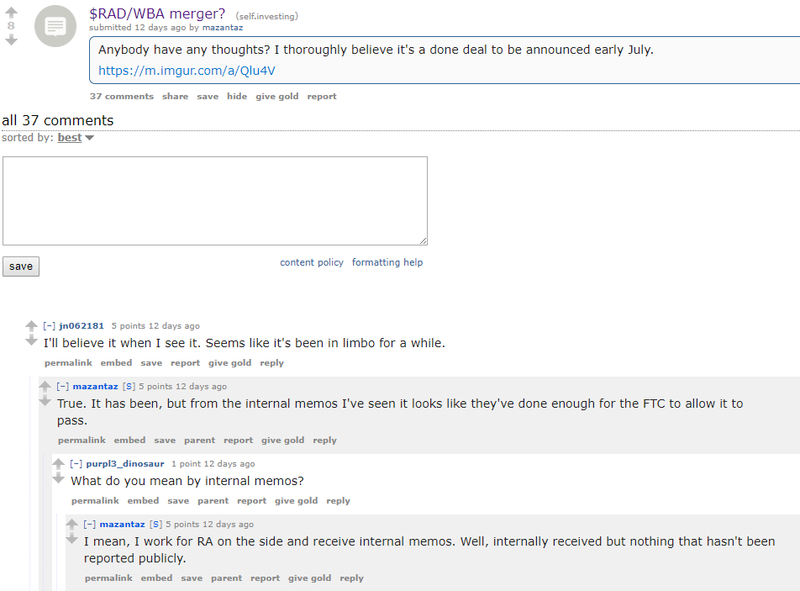 A few other bloggers are also running related posts on topic, so we all got together to post at the same time. This way you can get a diverse perspective on it. My energy usage has sky rocketed 95% percent year over year this summer. The big change this summer has been that I finally live in a place with central air conditioning. It’s like living in the future. I’ve lived in places without central air conditioning–or dishwashers– for the past few years to cut costs. The weather around Chicago isn’t too bad, so I’ve been making do with a bunch of fans and a small window unit air conditioner. I guess my cheapskate system of cooling down only a single room should be more efficient; I just never thought it would be twice as energy efficient. For the past 3 months, I’m roughly tracking at 760 kWh this year versus 388 kWh last year. The weather here in Illinois didn’t start to ramp up until June, which is when the air conditioner started to kick on constantly. Seeing the June electricity bill kicked some sense into me. I wasn’t tracking usage to closely until I saw the cost and the numbers. I was afraid that July would be even worse, so I started to dig into the data to see what I could do. For reference, I live in a 2 bedroom condo surrounded by other condos. The building is brick and at least a hundred years old but with newer window, so it’s not terribly insulated. I generally keep the thermostat set to 75 degrees with schedules around times when people will be home or not. 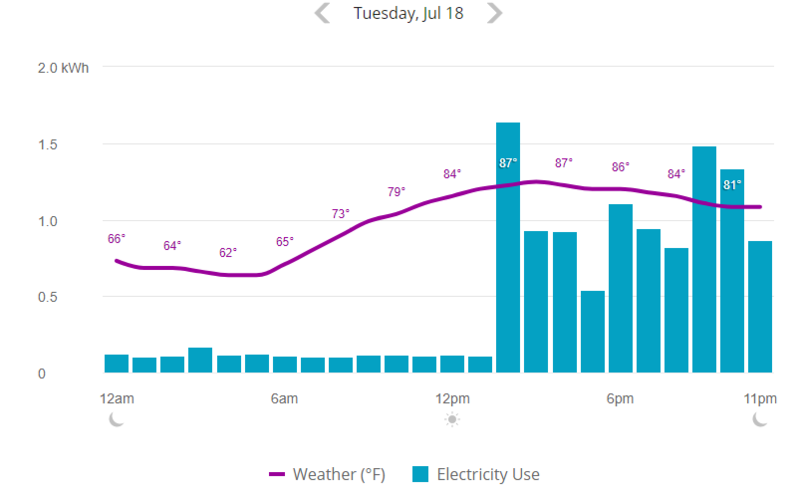 My energy provider has a really detailed chart of energy usage by day or hour and with overlays for the temperature. As you can see from the graphs, my baseline energy usage is about $0.30 / day or roughly 3-4 kWh per day. 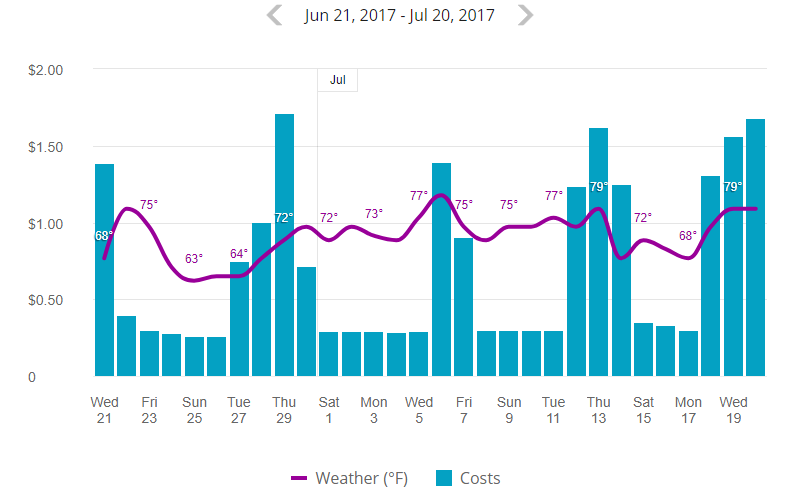 On the days that the AC is running more, my costs/usage multiply 5x per day. Here’s a day where I was working from home and waited to turn on the AC until the thermostat hit 78 degrees. Lights, applicants, computers, and what not were all on the at 1pm. All of these things barely used any energy compared to 2pm when I switched on the cooling system. Now that I knew that the air handler and air conditioner were giant energy hogs, I started to watch the thermostat like a hawk. Previously, I was a little lazy about turning it on and off or managing the schedule. I didn’t realize that a couple hours of AC could use as much energy as the rest of my condo for the day. I also dragged my array of fans out of storage. 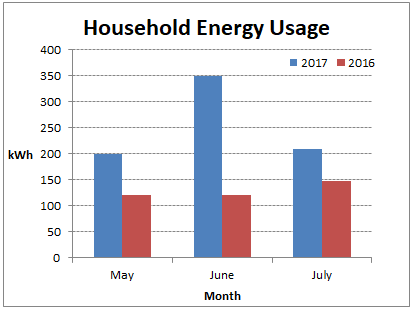 So I feel a lot better now that July’s pretty much over and I was able to bring the energy usage down to a more reasonable level. I’ve thought about getting a Nest, because the scheduling system on my thermostat is kind of clunky. I used to think a lot about getting energy efficient lights and unplugging appliances when I leave. But all those things are small potatoes compared to my cooling system. At this point, I’m thinking about looking into getting our system checked out. It’s about 10-11 years old, so it’s starting to approach the end of it’s life.